My name is Antoine Higelin, I’m a 23 year old student in mechanical engineering. In the future I’d like to become an engineer in industrial production. I started simracing with Gran Turismo 2 on PS One, then Gran Turismo 4 on PS2. Later I switched to Forza 2 and 3. I raced the French Forza championship in 2010 and became French champion in the less than 15 years class. In 2011 I switched to iRacing because it is so much closer to a simulation than Forza and Gran Turismo. What I like most in iRacing is the realistic effect of every parameter when tuning the settings of the chassis. I’m very happy and proud to have joined Apex Racing UK in early 2013 during S1 Road to Pro. Talking with experienced drivers, sharing setups and ideas to improve my driving skills helped me tremendously to get my Pro license. I earned my iRacing Pro/WC License in the 2013 Pro Series and then competed in the iRacing World Championship Grand Prix Series from 2014 to 2018. 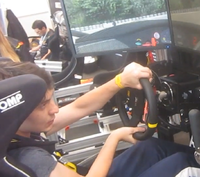 I have also been competing in team world championships (Blancpain GT Series from 2016 to 2017 and VRS GT iRacing World Championship in 2018) and won several regular iRacing championships. In 2019 I am driving again for Apex Racing Team in the 2019 Porsche Esports Supercup as well as in the VRS GT iRacing World Championship with my team mates Kevin Ellis Jr, Jamie Fluke and Alex Simpson. This page was last edited on 21 April 2019, at 11:31.